Is there any part of Britain still unknown and undiscovered? Anywhere still anxiously awaiting (or dreading) a visit from its first tourist? Alas, probably not. But there are still a precious few hidden corners and secluded valleys in Scotland, free from any accommodation for the curious traveller. Ythan Valley was one such place, until David, Libby and daughter Iona decided to open a campsite in their meadow. 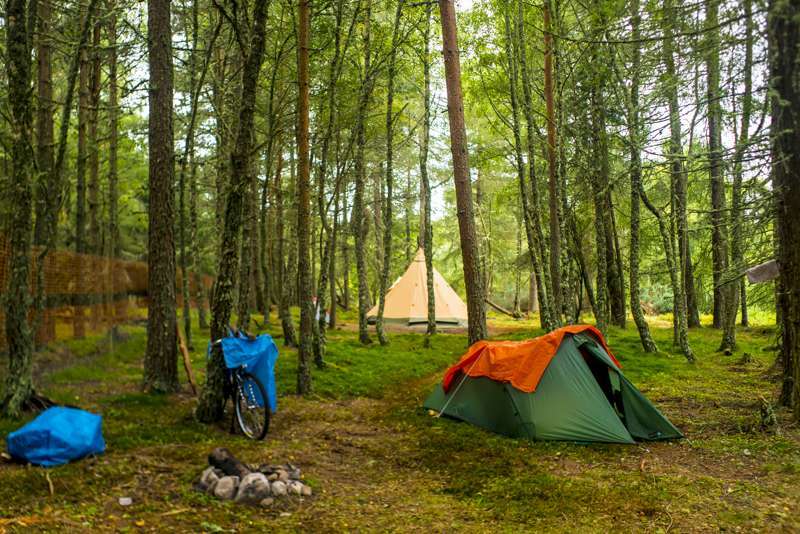 Despite it’s rather Welsh-sounding name, Ythan Valley campsite really is Scottish, and can be found tucked away in a north-eastern corner of Aberdeenshire. This undisturbed part of Scotland can’t compete with the Highlands for dramatic scenery, and thus there are fewer tourists. Those who do venture here tend to hug the coastal margins rather than stray inland where, in places such as Ythan Valley, visitors are usually limited to day-trippers. 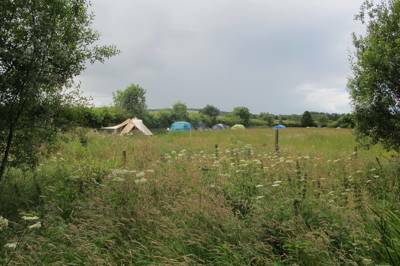 But things have started to change since these five pitches at Smithfield Croft appeared, along with four beds in the onsite lodge. The campsite is tucked behind the croft on the edge of the small hamlet of Ythanbank, and from here the lucky and exclusively small number of campers can wander as lonely as clouds in the empty – but not bleak – surroundings. Camping here is a comfortable experience indeed, and the welcome extraordinarily warm and friendly. You get the impression that the campsite staff (the family) are really, at heart, doing this for the fun of it and to share their rural backwater with new folk. This ethos extends to the slightly theatrical, converted coal shed, now a quirky campers' Wash House. But that isn’t all they do here to make you feel at home, for Libby does B&B, but not in the traditional sense; here it’s ‘bread and breakfast’. The early morning sustenance they rustle up is varied and delicious and can even be delivered to your tent if you so wish: full Scottish or veggie breakfasts, bacon butties, eggs-however and the speciality of the house – toast – or, more accurately, Libby’s toasted freshly baked bread. It's little wonder then that the eminent folk at Aberdeen City & Shire awarded Ythan Valley the prestigious Best Holiday Accommodation in their annual tourism awards in 2015. Campers can order a fresh loaf every day in a bewildering variety of seed mixtures and flavours including granary; pumpkin & sunflower seeds; chickpea, coriander & cumin; cinnamon & raisin; onion & rosemary or just a plain white or brown loaf. You can even invent your own recipe. So be sure to ditch the diet before you come here. All this talk of being in the back of beyond, while it feels true enough on the spot, may not be wholly accurate. For instance, if ‘one’ has a weakness for stately homes, Haddo House and Fyvie Castle are an easy drive or cycle away. Both boast landscaped gardens and rambling country parks with woodland and lakeside walks, ideal for working off all that baked breakfast goodness. The nearest settlement, Ellon, is four miles away and if campers still feel the need for the big city, the local urban madhouse that is Aberdeen lies just over 20 miles away. This may seem like a long way in England, but up here, in the wider world, it’s positively local. But with the welcome, space, tranquillity and completely unspoilt nature of the countryside on hand at Ythan Valley, it’s tempting to just stay put and maybe tuck into a little more of that bread. Tucked away in the tranquil Ythan Valley, surrounded by rolling farm land and beautifully ‘large’ skies, we are a tent-campers retreat. With half the rainfall of western Scotland and no midges (yaay!! ), our little site has been deemed one of Scotland's hidden secrets and has cheerfully been awarded Best Holiday Accommodation in the north of Scotland. We also have a couple of private hide-away pitches... a wee bit of seclusion... your own winding path & a stream to paddle your toes in! 'A little bit extra on the pitch fee but soooooo worth it' ! For those wanting to partake of Libby's (now famous!) breakfasts be sure to check with her, because some days she is away early, helping out at a couple of local National Trust properties. “It’s a lovely change from all the commercial sites – fantastic views!" Only a few tents and a few people at a time so pitch numbers are limited. Worth calling ahead to book. Good facilities in the new quirky wash house with toilets, shower and washing up sink. Plenty of options: Haddo House (08444 932179) has gardens, a country park, and produce shop; BrewDog Brewery (01358 724 924) has a particularly popular tap room open every day with tours of the brewery too; Aberdeen Maritime Museum (01224 337700); Satrosphere Science Centre (01224 640340); Glen Garioch Distillery (01651 873450) does tours Mon–Sat; Codonas Amusement Park (01224 595910) is a standard theme park on the beach at Aberdeen. Then Dunnottar Castle (01569 762173) is one of the most impressive sights on the Scottish coast. The Tolbooth (01358 721308) in Ellon is a traditional pub with a big selection of malt whiskies and no food to distract from the fine Scotch flavours. The Redgarth (01651 872353) at Oldmeldrum has been CAMRA’s Regional Pub of the Year numerous times, and serves good food; it’s very popular with locals and campers alike. 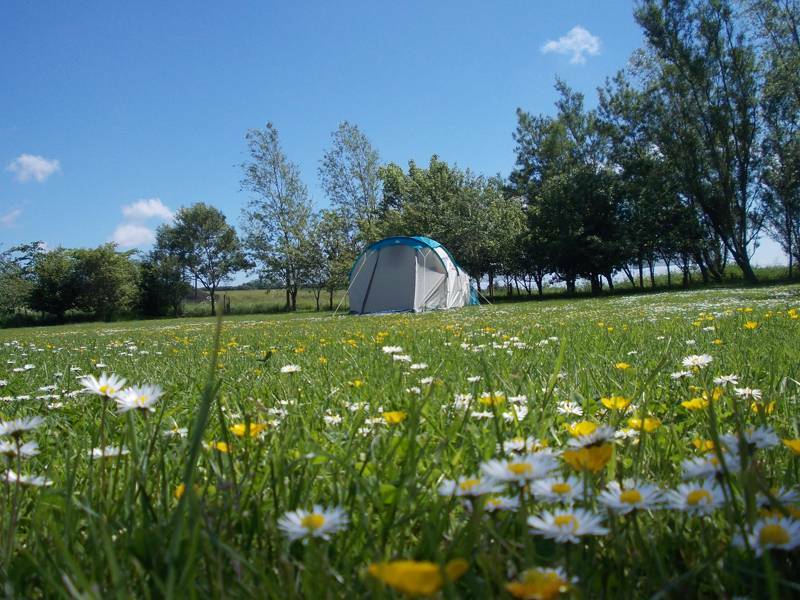 Tent with 1 person is £10 per night; additional adults £5; children under 12 years £3. The Little Lodge log cabin is usually let on a weekly basis but this can change if needed. The tariff is dependant on the number of occupants. Contact for more details. Follow the A90 north from Aberdeen for 15 miles, then left on to the B9005 through Ellon. Continue along the road (including a right turn) to Ythanbank, go straight on into the village (ignoring where the main road turns left), then right into the first narrow lane sign-posted to Schivas, and then immediatley right into Smithfield's long drive.